My revision plan has been … untenable. I had hoped to start with a practice of the entire exam, find my weak spots and get a sense of time, and slowly work away at those, then do another full practice of the entire exam maybe a week before the actual exam time. I liked this plan because the weak spots identified this way would be exactly the types of questions to show up in the exam, as the exam questions seem to (mostly) follow similar types of question year after year. The practice exam before the real exam would hopefully work as a confidence builder going in, or at least a road map of where to start cramming in the last week. Unfortunately, this plan requires two uninterrupted blocks of three hours several weeks apart. I can’t seem to get any block of time that large while working full time, caring for little ones, and other responsibilities. I’ve been so good with time management for studying over the last two years that it’s completely escaped my attention that I normally handle small day-to-day home life responsibilities a few times an hour between blocks of concentration. So instead, I’ve been revising … everything. All twelve units. I got through the last one a couple of nights ago. I’ve been tracking my progress using MST-124’s Revision Quiz. This is a quiz with just 12 questions, one random one from each unit. I’d have thought that this structure would make it very uneven for a battery quiz, but it proved to be quite effective. No matter how many times I took it prior to revising, it took me one hour (with a variance of 7 minutes). After three weeks of revision, it’s down to under 25 minutes. I’m pretty sure that’s as fast as I’ll be able to get, so the rest of revision will be all about accuracy. It’s a shame my revision time is nearly half up already. Most students are starting their revision period today, though (as our final TMA was due last night), so I’ve given myself a large advantage. So if I remember 25% of the material covered by the exam, and I get 1/5 of the remaining 75% (or 15% of the total) questions due to probability, that should combine to see me through to the 40% needed to pass. Although making assumptions based on probability isn’t wise, at least I know my basic algebra is sufficient. You know how teenagers seem to know absolutely everything? That’s how I feel today! I just submitted my iCMA43 (MST124’s quiz for the calculus modules) and got full marks. I’m absolutely insufferable right now. There was a tutorial last night for calculus, which I was late for. (My phone is … Well, it’s hard to describe without swearing. But I’m blaming the phone because the alternative is to accept responsibility for my own choices, and forget that.) The tutorial really built my confidence. I made all the same arithmetic and algebraic errors I always do (so no chance of doing well at the exam), but my understanding was where it needed to be the whole way through. I still have one or two days worth of calculus to get through, and I need to finish up the calculus parts of TMA03, but I can get back to a normal study schedule. (I put TM129 to the side to concentrate on calculus.) So sometime next week I’ll start handling two modules simultaneously again. Since I only have the Linux block to do there, and I already run dozens of headless Linux virtuals (and one physical Raspbian box), I should be able to complete TM129 long before revision for MST124 starts in May. My TMA02 results are overdue by a day, now, so I’m doing my best not to be impatient about it. I get that my tutor is busy, and I’ve been in that situation. On the other hand, it’s entirely possible that there really was a problem with my submission and there’s nothing to mark. I’ll probably edit this entry once it’s back. I’ve spotted a few unimportant mistakes in it, so it probably won’t be as good a result as my last one, but I’m not expecting it to be too much worse. Let me amend that. I admitted defeat. Like, forty or fifty times. On one activity. (Activity 17, combining differentiation rules, if anybody cares.) But I also went back for more the same number of times. I finally conquered it confidently and moved past it, with some help from Sal Khan. But I wasn’t the only one that was nearly completely derailed by that single activity. Every few hours, somebody in the Facebook group will say that they’re really struggling with Unit 7, or just about to give up on maths completely, or feel like they understood maths until one activity made them feel like an utter moron. Practically without fail, they’re all staring at activity 17 in panic. When I go from understanding everything well (or well enough) to understanding nothing, I typically assume that I’ve skipped a major step without realising it. But when nearly everybody has the same experiences, I feel more comfortable thinking that it isn’t just me. There was either a foundational piece left out, or simply too steep a learning curve. It highlights the importance of not relying solely on one source for information. 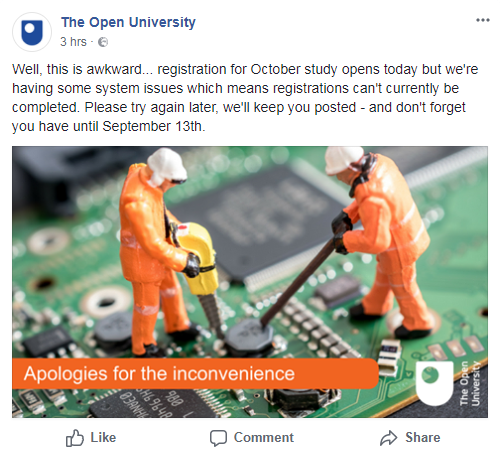 The Open University often seems fanatical in its defence of its material always being individually sufficient and superior to all other sources. (This is only my opinion from anecdotal observation.) For example, any suggestion in the official MST-124 forums to check out an external resource on a topic is swiftly refuted by tutors on the course, and original OU materials are reiterated. Without fail. In my experience, no one source has all the right answers, and no one way of learning is right for everybody. When doing assignments, it’s important to prepare them based on the information you’re instructed to peruse. But for understanding, make sure you find whatever resource you can find that helps you understand. If there’s something fundamentally different from what’s in the OU materials, it’s an excellent opportunity to open a dialogue with the tutor and gain a considerably deeper understand of the nuances involved in the reasons for the difference. It took me five. days. to get past activity 17 using OU materials. It took me about two hours on Khan Academy. Find what works for you. Self-reflection on how I learn is one of the most valuable skills I’ve developed so far.